A member of Sigma Alpha Epsilon competes in Tugs Wednesday afternoon at the Campus Pond. They lost to Sigma Pi. Members of Sigma Nu celebrate after their win against Sig Ep at Tugs Wednesday afternoon at the Campus Pond. It was the longest tug of the afternoon. 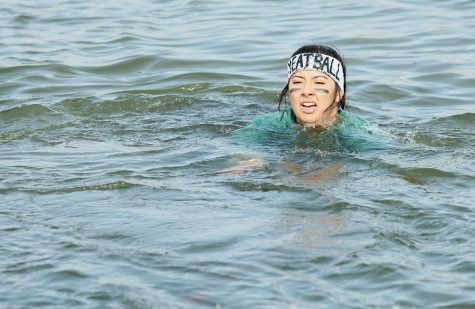 Delta Zeta was inching closer to the water, closer to defeat, when the person anchoring for Kappa Delta fell and the round took a turn. People stood on tippy toes, stretching their necks to get a glance of Kappa Delta on the other side of Campus Pond as Delta Zeta took advantage of the fall and tugged the rope backward, toward safety. Kappa Delta competes in Tugs Wednesday afternoon at the Campus Pond. They lost to Delta Zeta. Delta Zeta walked away from the second day of Tugs on Wednesday afternoon as champions over Kappa Delta. “I was in tears when we won,” said Alexis Knippen, a senior psychology major and the captain for the Delta Zeta team. Knippen said Delta Zeta does not have the best history of winning, and it meant it a lot to win, especially since her team consisted of first-year tuggers who spent close to 10 hours a week practicing for the event. On the other side of the pond, Catherine Ward, a senior dietetics major, was tugging for Kappa Delta. It was her second year tugging, and she said the hardest part of Tugs is the strength it takes to pull the rope back. “I mean, the rope itself is pretty heavy, but then you have your opponents on the other side too; it just takes a lot of strength and a lot of endurance,” Ward said. Two other sororities and four fraternities faced off during the afternoon. Several of the members described what the hardest part of tugging was, what it felt like to win and what Greek Week meant to them. Alpha Sigma Alpha won the next round against Alpha Phi and will advance to the final round on Saturday. Alyssa Lepore, a senior psychology major and coach for Alpha Sigma Alpha, was tugging for her fourth year. “You black out and suddenly you’re there (tugging),” Leopore said in reference to what it is like on the rope. A member of Kappa Delta swims out of the pond during Tugs Wednesday afternoon at the Campus Pond. Kappa Delta lost to Delta Zeta after their anchor fell and could not continue the match anymore. Leopore said she is “jazzed about winning” but will remain humble as the team waits for the final round. 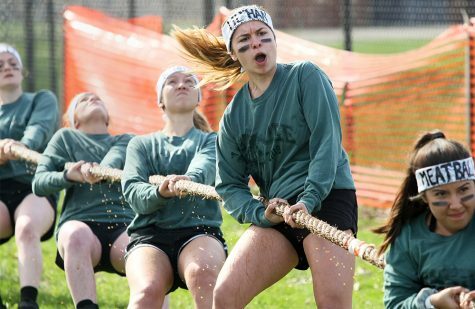 Brianna Walker, a junior English major and another coach for Alpha Sigma Alpha spent her third year on the rope and said the hardest part of tugging is waiting before the signal to start. “The before is the hardest part of tugging, right before you run into the snap because you know the horn is going to go off at any second,” Walker said. Walker agreed with Leopore and said despite the win, the team wants to stay humble. “We don’t want to walk away being too cocky because you just never know what’s going to happen,” Walker said. Sigma Alpha Epsilon and Sigma Pi were the first fraternities to take the rope Wednesday and Sigma Pi won. 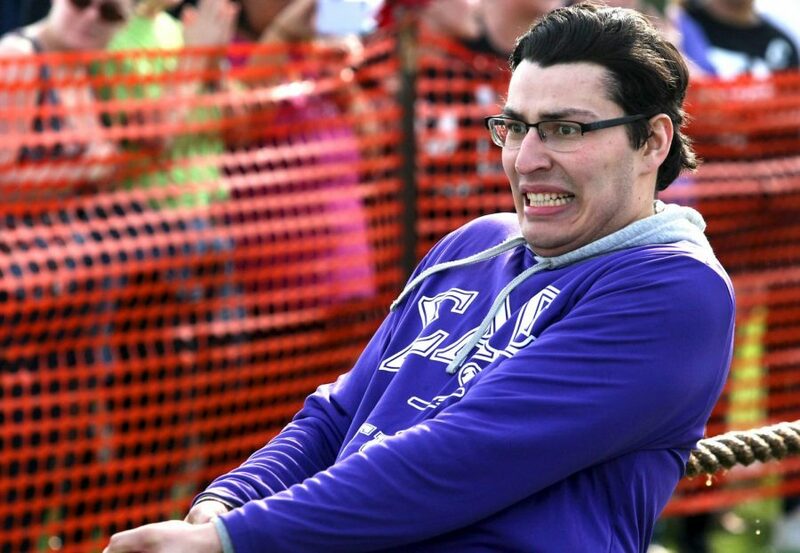 Gabe Villanueva, a junior biology major, was the “front guy” on the rope taking the charge for Sigma Alpha Epsilon. “The front guy is the guy in charge of keeping the rope straight and I knew I was going to go for a swim,” Villanueva said. He said the hardest part of getting ready was getting the motivation to go out there and do it. Sigma Nu and Sigma Phi Epsilon were the last to take the rope and Sigma Nu won. 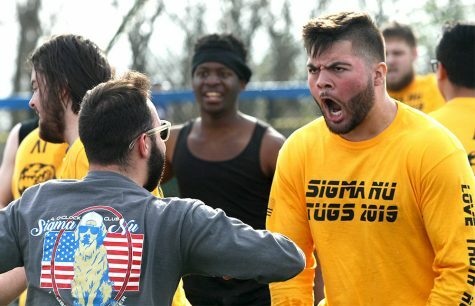 Dylan Seitz, a senior sports management major and member of Sigma Nu, was also the front man and said Tugs is a mental game. He said Greek Week is one of the best weeks of the year, especially when someone is greek. Analicia Haynes and Corryn Brock can be reached at 581-2812 or [email protected].